A good resume is a must-have for any job seeker. But for remote job seekers, it becomes an invaluable tool that can make or break your chances of getting hired. When recruiters and hiring managers look to fill a remote position, they want to make sure they find someone who is as close of a match as possible. Your resume can prove you ARE that person. This simple hack can be used for anyone no matter what kind of remote job they’re looking for — sales, marketing, design, customer service, etc. — and can greatly increase your chances of getting callbacks and interviews! Before we jump into hacking your resume for remote job search success, let’s look at how the hiring process goes, from a recruiter’s perspective. It’s important to understand how your resume is being viewed (or not!) before changing it. We’re in a time when keyword optimization is, well, key to getting noticed online. And since most job searches take place on the Internet as opposed to going in person to drop off a resume and shake hands at the door, you’re going to need to brush up on your keyword know-how if you want recruiters and hiring managers to take notice of you. Did you know most resumes that are submitted online are never seen by humans? It’s true. The majority of companies and recruiting agencies use programs called Applicant Tracking Software (ATS) to screen resumes before they are passed onto a real person. Let’s pretend you hop on Indeed and do a quick remote job search. At the top there’s an amazing sounding position you know you’re perfect for. So, you pull up your resume, upload, and hit send. You’ve got this, you tell yourself. But weeks later, you never hear anything back and you notice the job is now marked “filled.” Bummer. 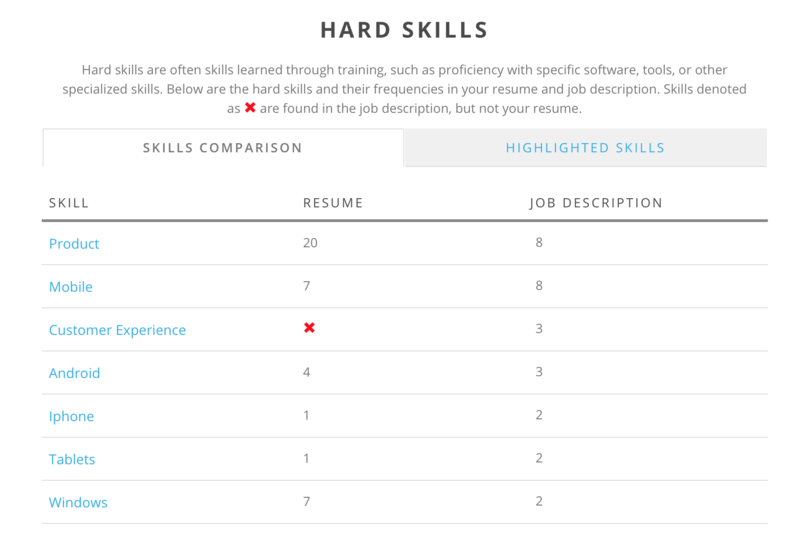 A non-keyword optimized resume may be to blame — not you as a worker! You see, when you submit your resume to a company that uses ATS, your resume is scanned for relevant keywords. The greater number of keyword matches in your resume, the greater your chances of getting an interview. I’m glad you asked. This is where the oh-so simple remote resume hack comes into play. The keywords you need to strategically place in your resume can be found — wait for it — in the job ad itself! It’s true — look no further than the ad to find the relevant keywords to help you get past the ATS so you can wow a recruiter or hiring manager with your telephone interview skills. A job advertisement isn’t just a company’s cry for help. It’s basically the company’s way of putting their ideal employee into words. Your job is to scan the job ad, looking for the keywords and put them into your resume. That’s it. 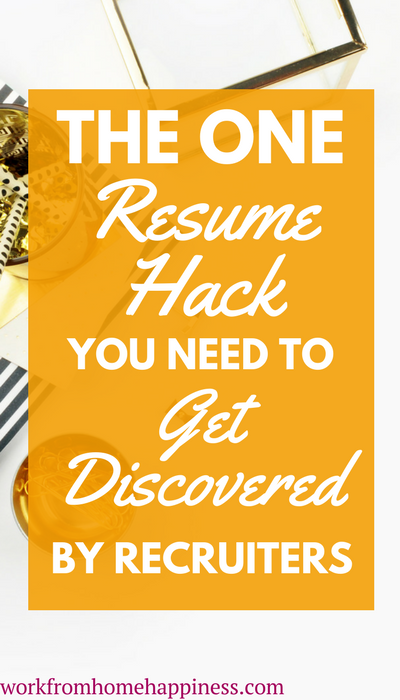 It really is a super simple resume hack that can dramatically increase the number of interviews you get. To show you what I’m talking about, let’s take a look at the example below. 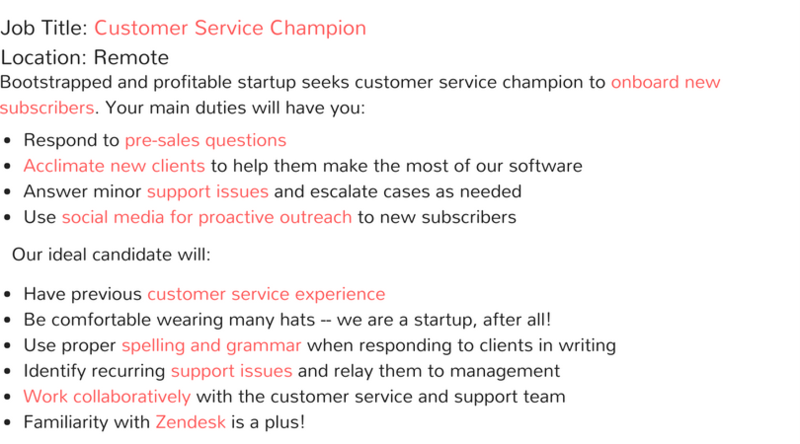 I’ve highlighted keywords from the ad for this remote customer service position that should make their way into a resume! Do you see why those keywords are relevant? If so, great! You’re one step ahead of the competition. If not, read on to learn how to easily identify what makes a keyword a keyword so you can use them to your advantage. What Makes a Keyword a Keyword? There is no exact science when it comes to identifying relevant keywords in remote job advertisements, but there are things to keep in mind. For starters, always be sure to carefully read a listing and take note of hard skills and soft skills that are mentioned. Often, these are the specific traits, characteristics, and skills recruiters are looking for in an ideal candidate. 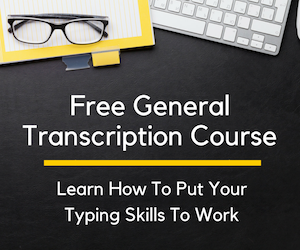 As a reminder, hard skills include things like Photoshop, Excel, writing, proofreading, Indesign — basically any kind of software, program, or measurable skill you can demonstrate. Soft skills include innate characteristics unique to us as professionals. Organization, interpersonal skills, being deadline driven, and leadership are all types of soft skills. Your soft skills often serve to complement your hard skills! Another keyword to lookout for is the job title itself. The majority of the time, recruiters are looking for candidates with past experience related to a current opening. As such, they’ll specifically search for any resumes that mention the current job title. Hint: Include the job title in your objective statement or professional profile! This lets you include that specific keyword even if you’ve never previously held that title before! When first keyword optimizing resumes, it can be tricky. And you might even second guess your efforts, wondering if you’ve placed enough of them into your resume. 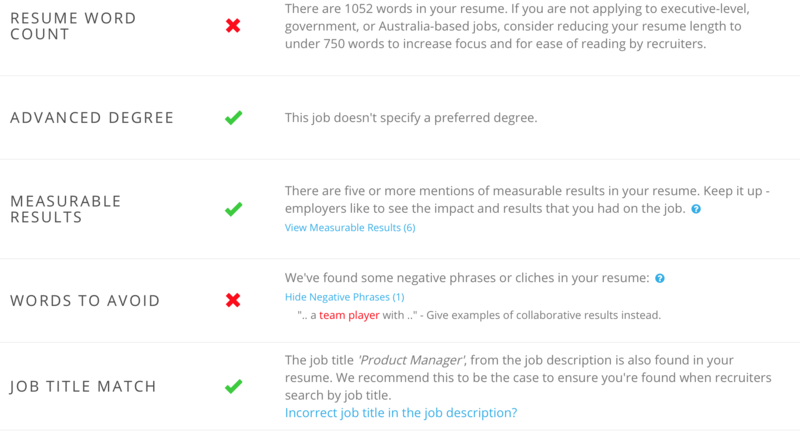 In fact, you can drive yourself crazy reading and re-reading job descriptions as you pull keywords from them. The good news is, there is a handy online tool you can use to help you become a keyword identifying machine. It’s called Jobscan. What is Jobscan? In short, it’s an online tool built specifically to help job seekers make the most of their resumes through keyword optimization. And it couldn’t be simpler to use. Using Jobscan can help improve your resume, which then can lead to even more remote interviews! 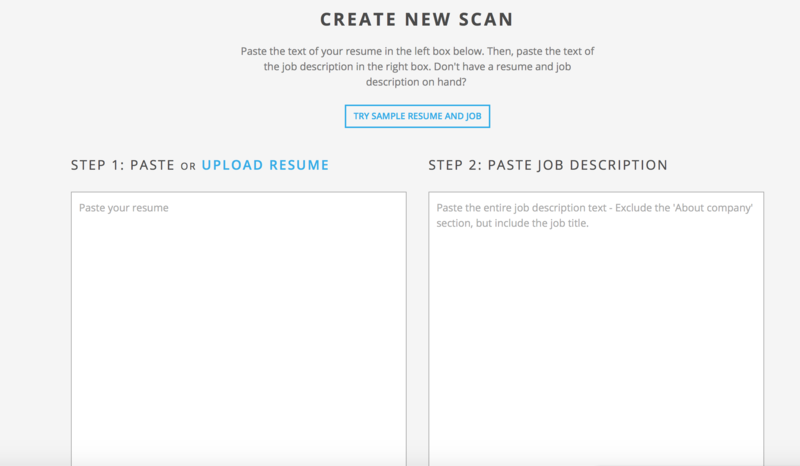 You can try Jobscan for free and start optimizing your resume today. Be sure to stop by their blog for even more helpful resume advice and free career resources. Remember, while it may be easy to upload the same resume to every remote job you apply for, it’s not going to yield the best results. 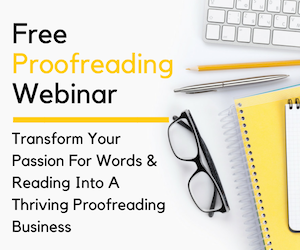 Instead, take the time to keyword optimize every single resume you submit! In the world of remote job searching, it’s not about the quantity of applications you send out but the quality. Ready to put this resume hack into action? 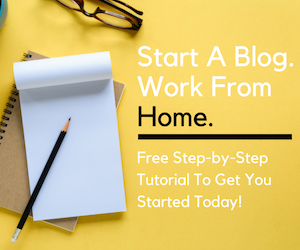 Be sure to check out my 22 favorite blogs, websites, and job boards for legitimate work-from-home jobs. Feeling stuck? Have a question? Hit me with them in the comments below! I’m always happy to help. P.S. This post contains affiliate links for Jobscan. I only recommend products I use and trust. Learn more about my use of affiliate links by reading my disclosure statement!